I can’t not notice them. And there’s symbolism in these stories. I can’t not notice that either. This is a story about a hot dog. … but, really, it’s about more than a hot dog. It’s sort of like The Ladybug in the Bathtub, which if you haven’t read (but really, you should click on the link to read), was about spreading your wings to fly before getting eaten by an evil cat. The hot dog story takes place at a ballgame. We had nose-bleed-high seats near the top of the stadium. Many stairs up. Two innings in, a large family arrived to fill the rest of our row. We stood to let them pass to their seats. She headed out (we stood to let her pass), down the many stairs. She came back in the bottom of the 3rd – lines were long at concessions – climbing the stairs cautiously with cardboard containers precariously stacked. (We stood to let her pass) and she handed out the differently-topped hot dogs to each proper recipient. But one was without its requested ketchup. And she was short on napkins. Worst of all, she realized she had completely forgotten to take her husband’s order. He had no hot dog! She immediately offered to go back for the missing items and moments later, arms now unloaded, off she went (we stood to let her pass, yup, again), down the stairs. The lines must have still been crazy long because she didn’t make it back up the stairs until the bottom of the 4th (we stood to let her pass) when she handed out the remaining food. About two minutes later, one of the kids needed to go to the bathroom. So off she went again (we stood to let her pass), down the stairs with junior in tow. Which was about the time her family started asking for dessert – several ice-cream sundaes in those plastic helmet cups, one cotton candy. We resisted the urge (as we stood to let her pass), to place our own order as well. I mean, if she’s going to keep going up and down these stairs, how hard would it be to bring back a few bottles of water? This woman came to a baseball game but missed nearly all of it, so busy running errands for her family – back and forth, up and down the stairs, orders and re-orders, bathroom breaks and baseball helmet sundaes. I want to be clear I was not judging. I was simply observing. I don’t know her story. Maybe she hates baseball and had no interest in the game. Maybe she lives to serve. Maybe it’s absolutely none of my business. But it got me thinking… not about her story, but about mine. Your symbolic hot dog, silly. What is the “hot dog” in your life that you keep running for, up and down the stairs, to serve to someone else? What is the impact of missing the “ballgame” because you’re so busy taking care of everyone else’s needs? Why do you keep “climbing the stairs” but not really getting anywhere? If someone says to you, “What do you want?” are you ready to place your order? 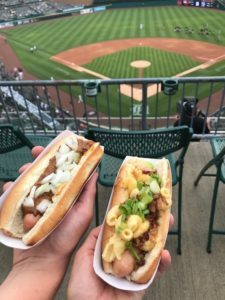 (And no, I’m not talking about actual hot dogs, but if we were I’d take one with mustard, an overpriced beer and a solid view of the game). I’m just wondering what you might like to order if you could get anything you wanted on the Menu of Life. You’ve got 9 innings to live. Don’t waste them fetching someone else’s hot dog. Valerie Gordon is the founder of Commander-in-She, a career and communications strategy firm that helps clients find the power in their own stories for greater success and satisfaction at work and in life. She went to 7 ballgames with her son this year and ate a lot of hot dogs. He helped carry all of them up the stairs.